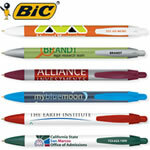 Promotional Products > Resource Center > Top 10 Promotional Pens to Buy? Top 10 Promotional Pens to Buy? Why is it #1... The Bic Stic Clic Pen has got to be the most diverse pen that cost under $0.40/each. 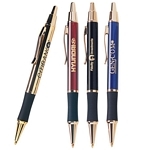 This promotional pen has over 300 different color combinations so that you can match the pen to your business's logo. 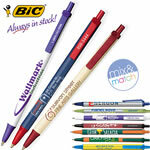 The Bic Clic Stic promotional pen is available in Blue, Black, Red, and even Purple ink. Perfect for imprinting a lot of information, the price of the Rotating Message Pen includes a logo imprint and 6 rotating lines of text inside the pen. Perfect for adding marketing slogans, coupon codes, retail store locations, and more. Not to mention that your clients will take the time to play with it because it's a "new toy" and their curiosity will make them click through all 6 lines of text! Price includes a 1-color imprint on all 3 sides! And with an optional clip imprint. The Paper Mate TriEdge is available in frosted or solid colors. Available in 8 colors, the Uni-Ball 207 Gel Ink Pen is simply a favorite by everyone. 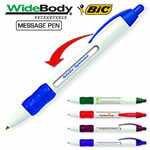 A great signature pen and cost effective enough handout in bulk, this pen will be noticed! The Bic WideBody Retractable Pen has the feel of a jumbo pen and with a decent size imprint area, and fits within a reasonable budget. Available in black, blue, or red ink and fine & medium point tips. Another Uni-Ball classic pen used by tons of people in every industry. This long lasting roller ball pen is preferred for signing documents and writing checks by tons of business owners. Our color changing pencils is one of the hottest items that we offer. Our line of mood pencils will change color to the heat in your hand, a perfect promotion for schools, teaching and creative learning classes. PenImprint.com also offers other Mood Pens. This Uni-Ball classic is perfect for everyday use in the office and you can get up to a 4-color artwork imprint. The Uni-Ball Onyx Fine Roller Ball Pen is preferred by business executives and small business owners for everyday use. Promotional Paper Mate Bros Stick Pen is an ideal economical solution for any budget, we offer tons of stick pens but the Paper Mate Stick Pen seems to stay in the top ten sellers. The Monte Cristo Pen is an ideal executive pen for an employee appreciation gift or preferred client gift. The Monte Cristo comes in cinnamon, electric blue, black, and even with a gold barrel. How do I distribute my promotional pens? How do I choose a promotional pen? How should I design my promotional pen? How many promotional pens should I order? How to pick a brand of promotional pens? Why do pens make the best promotional products?